Alef Residences ... under construction. 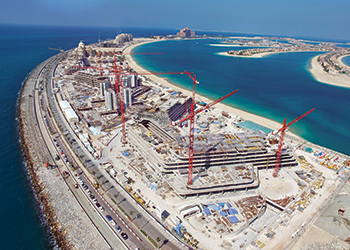 Al Sharq Investment has announced that the structure of The Alef Residences in Dubai, UAE, serviced by W Dubai – The Palm, is 93 per cent complete, while the hotel structure is already 100 per cent complete. The construction team has been working round the clock to meet targets with the hotel having topped out in May in line with its scheduled completion in March 2017. Meanwhile, the residences are set to be topped out this month (July 5) with completion expected in June 2017. A showhome of the residences has also been unveiled on site, where future and potential residents can come and explore the space in which they’ll live. Commenting on the works, a spokesman for the project says: “The overall percentage completion of the entire project, taking into account the total value spent is almost 48 per cent. Mechanical, electrical, and plumbing (MEP) works are progressing in the hotel from the basement to Level Four, with almost 33 per cent of installations complete, and the façade work is moving ahead with almost 50 per cent of the framing finished. 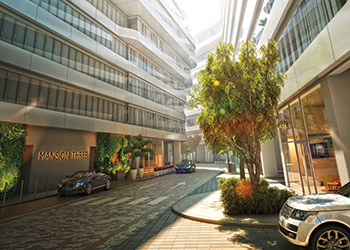 “The Alef Residences have been built in response to a distinct gap in the Dubai residential market, a need for quality on another level, leading to residences made from only the finest materials, delivering spacious and comfortable apartment living beyond the current industry expectations,” he says. The Alef Residences will combine contemporary, classic design elements with an Arab touch, and a design that provides the perfect balance between space and intimacy, indoor and outdoor, privacy and socialising, light and dark. Using only the finest materials, The Alef Residences has partnered with some of the most internationally respected brands in their field. Boasting the latest generation of Miele appliances, the gourmet kitchen’s lavish design includes countertops and backsplash from Dekton of Spain and cabinetry from Poggenpohl of Germany, while the walk-in wardrobes are by Polliform of Italy. Currently under construction on a 46,840-sq-m plot of land, the fully funded Alef Residences are scheduled for handover in Q2 2017. A selection of two-, three-, four- and five-bedroom luxury homes offer from 4,800 to 15,000 sq ft of spacious accommodation, with stunning floor-to-ceiling panoramic ocean and skyline views, large balconies and gardens, some even with their own pool. 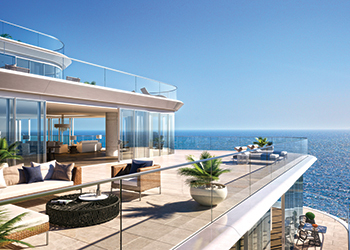 The top floor is reserved for two single penthouses and three duplex penthouses. The project has been tailored to cater for a diverse range of cultures with the top two floors just shell and core so owners can take advantage of world-class interior designer partners to customise. The contemporary and sophisticated residences are surrounded by a tropical landscaped garden and a 475-m-long white sandy beach – the largest private residential beachfront location in Dubai. The beachfront promenade is expected to become a haven for relaxation and recreation, with private cabanas and a range of water sports. The residences will also boast an exclusive private members’ club: the Club 104 is available to residents and select VIPs to unwind, socialise and dine. In addition, residents will have VIP access to the W, its 24/7 concierge service and amenities, including six innovative dining destinations. Alternatively, they can choose to relax in the comfort of their own home and take advantage of the in-residence catering service, ordering from a broad selection of W delicacies. Al Sharq Investment brings together two of the region’s largest and most respected conglomerates – Qatar’s Al Mana Global and Saudi Arabia’s Al Sharq Group – in a partnership that strives to set new standards in the luxury lifestyle sector. Al Sharq Investment leverages the respective capabilities of each partner. Established in 1975, Al Sharq Group is recognised as one of Saudi Arabia’s industrial pioneers, having forged a reputation as one of the region’s biggest producers of plastics materials. Ensuing expansion has seen it successfully branch into other industries, most notably agriculture, real estate development, and hospitality. Al Mana Global ranks as one of the Middle East’s most diversified conglomerates, with more than 55 companies under management in eight countries across the region. Established in 1951, its business interests extend from real estate and retail investments to food and beverage (F&B), technology, media and entertainment. Its property portfolio spans the Middle East and the UK, and it is currently assessing further opportunities in continental Europe. In its home market of Qatar, Al Mana Global represents some of the world’s most prestigious luxury brands, ranging from Hermes to Giorgio Armani and Dior.